ITC(HS)8509 ELECTRO-MECHANICAL DOMESTIC APPLIANCES, WITH SELF CONTAINED ELECTRIC MOTOR, OTHER THAN VACUUM CLEANERS OF HEADING 8508. ITC(HS)8536 ELECTRICAL APPARATUS FOR SWITCHING OR PROTECTING ELECTRICAL CIRCUITS, OR FOR MAKING CONNECTIONS TO OR IN ELECTRICAL CIRCUITS (FOR EXAMPLE, SWITCHES, RELAYS, FUSES, SURGE SUPPRESSORS, PLUGS, SOCKETS, LAMP-HOLDERS AND OTHER CONNECTORS, JUNCTION BOXES), FOR A VOLTAGE NOT EXCEEDING 1,000 VOLTS: CONNECTORS FOR OPTICAL FIBRES, OPTICAL FIBER BUNDLES OR CABLES. ITC 85481010 Battery scrap, namely the following : lead battery plates covered by ISRI code word Rails; battery lugs covered by ISRI code word Rakes. 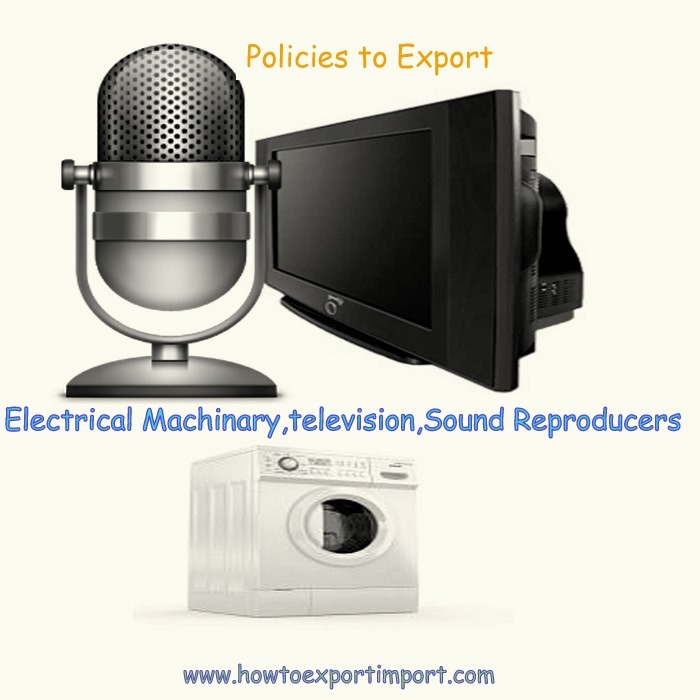 In this post, I have mentioned list of ITC codes which help exporters and importers of ELECTRICAL MACHINERY and EQUIPMENTS and PARTS, TELECOMMUNICATIONS EQUIPMENTS, SOUND RECORDERS, TELEVISION RECORDERS. ITC is also known as Indian Trade Classification (ITC code), RITC etc. These HS codes helps exporters and importers of ELECTRICAL MACHINERY and EQUIPMENTS and PARTS, TELECOMMUNICATIONS EQUIPMENTS, SOUND RECORDERS, TELEVISION RECORDERS to identify their product to use in customs department and other government and non government agencies in India to import or export of ELECTRICAL MACHINERY and EQUIPMENTS and PARTS, TELECOMMUNICATIONS EQUIPMENTS, SOUND RECORDERS, TELEVISION RECORDERS. I hope the information in this post supports exporters and importers of ELECTRICAL MACHINERY and EQUIPMENTS and PARTS, TELECOMMUNICATIONS EQUIPMENTS, SOUND RECORDERS, TELEVISION RECORDERS. The buyers of ELECTRICAL MACHINERY and EQUIPMENTS and PARTS, TELECOMMUNICATIONS EQUIPMENTS, SOUND RECORDERS, TELEVISION RECORDERS from India and sellers of ELECTRICAL MACHINERY and EQUIPMENTS and PARTS, TELECOMMUNICATIONS EQUIPMENTS, SOUND RECORDERS, TELEVISION RECORDERS from India in import export trade may use these ITC codes mentioned. The suppliers of ELECTRICAL MACHINERY and EQUIPMENTS and PARTS, TELECOMMUNICATIONS EQUIPMENTS, SOUND RECORDERS, TELEVISION RECORDERS from India and buyers of ELECTRICAL MACHINERY and EQUIPMENTS and PARTS, TELECOMMUNICATIONS EQUIPMENTS, SOUND RECORDERS, TELEVISION RECORDERS in India may please be noted, apart from six digit HS code, commonly adopted worldwide, additional two, four or six digit product classification code is accepted in other countries. Hope this article helps importers of ELECTRICAL MACHINERY and EQUIPMENTS and PARTS, TELECOMMUNICATIONS EQUIPMENTS, SOUND RECORDERS, TELEVISION RECORDERS from India and exporters of ELECTRICAL MACHINERY and EQUIPMENTS and PARTS, TELECOMMUNICATIONS EQUIPMENTS, SOUND RECORDERS, TELEVISION RECORDERS from India . Comment below your thoughts. Raj Setia : On 11 February 2015 My name is Rajat I am Australian Citizen and I am very keen to do some Import/Export from Australia/China to India. This is my first attempt to do that in the coming new year, I have no experience in import/export business. But I have done Business Management and I have done business in past. Currently working in IT for Australian Government. How can you assist ? a) I am not sure how you can help me, may be you can provide me list of the things which are currently hot and being exported from Aus to India. b) Guide me on steps from start to End for my 1st deal - I was thinking to Import LCD/LED TVs or Monitors to India? Vek M : On 18 February 2015 I've been wanting to import electronic components from TaoBao (it's an online portal in China target towards domestic consumers) because the prices are reasonable. I could buy some of my smaller/lighter components from some of the local-Indian online shops but they charge around 10-times more (ICs, diodes etc).Anyway, umm.. so I applied and got myself an IEC code under my name -i felt this was not really required because <25KUSD for foreign remittances is exempt and I guess import of components for personal consumption is also exempt from requiring an IEC code - however I'd still have to pay duty/CVD.Anyway, so I have the IEC code BUT I still don't understand exactly how all this works.. and I'm trying to understand the process hence the googling and me finding your nice web-site.Umm.. so.. I have an agent in China (just emailed her but she's not got back to me and i found her via google). I want her to use China-Post and send me the components which she'll buy for me and repackage and post it via air-parcel. 1. How do I pay her? I was thinking via paypal. 2. How does the package reach my house? 3. How do i pay the duty (Icegate) 4. What documentation does she have to fill up to send me the components - insurance? invoice? I have heard of Icegate and i will now register with them but they all expect a company and I am trying this as an individual. Anyway I don't anticipate problems registering with Icegate - should I worry about this? So assuming I pay via Icegate, how does the package reach my house? Who will deliver it to me? My understanding is that ChinaPost will try to deliver to me via the IndianPostal service - correct? But who is the carrier in all this and where does the bonded/customs warehouse come into the picture? Will I have to go to the International Airport and show my face there with paperwork (what paperwork?).. I thought the whole purpose of Icegate/EDI was that I could prepay duty etc... but does that imply I'll have to run about? SBR Technology services : On 16 June 2015 As we are a security system Integrator and Dealer Based in Bangalore. We are looking to import CCTV cameras from China and I have found a Vendor. Please guide us through Further Process. SBR Technology services : On 04 July 2015 As we are a security system Integrator and Dealer Based in Bangalore. We are looking to import CCTV cameras fro China and I have found a Vendoor. Please guide us through Further Process. pundaleek : On 18 April 2016 This is Pundaleek from Amplus communication Delhi, I need wireless equipment import.